Levitation platforms have always rose above (excuse the pun) other decorative products in the realm of design – by virtue of their attention-inducing uniqueness. But what if a levitation platform could also create a light show to sate your visual senses? Well, that is exactly what the Magic Cube brings to the fray with its magnetic levitating powers accompanied by an embedded green laser. Designed by Dale Rorabaugh and his team at Cool-Invent, the end result pertains to the effect of mind-bending physics and light – with the device flaunting its ‘expertise’ in floating and rotating a range of solid objects. In terms of sheer design, the Magic Cube has quite a few boasting credentials. To that end, the enclosure itself is created from extruded aircraft grade aluminum (with machine age brushed finish), and topped off with a mirrored acrylic surface. As for the lighting effects, they are derived from a solid-state green laser that is incorporated inside the magnetic levitation stand. 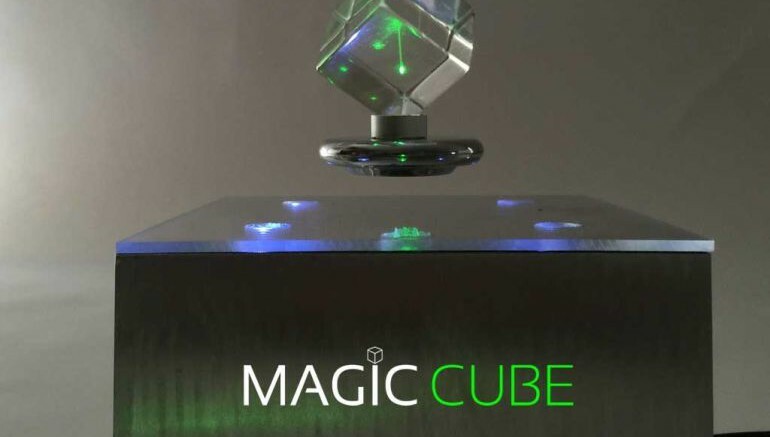 The other part of the package involves a magnetic hover disc and a prism cube – both of which can be used for the wondrous visual impact of objects floating in mid-air. The accompanying light show is rather accentuated by the transparency of this rotating prism. What’s more, you can put various decorative objects on the hover disc, ranging from small collectibles, memorabilia to even glistening jewelry items. However, do make sure that they are below 300 gm / 10.58 oz in weight, as that marks the hovering capacity of the Magic Cube. And, since we are talking about practical usage, the dynamic display stand does account for very low power consumption (less than 5 mW). It commands attention and motivates fascination. It is completely mesmerizing to watch the Magic Cube levitate an object, rotate it, and illuminate with a laser. When people walk into the room and see a Magic Cube, they are instantly drawn to it. We believe that this is set to become the next classic conversation piece.